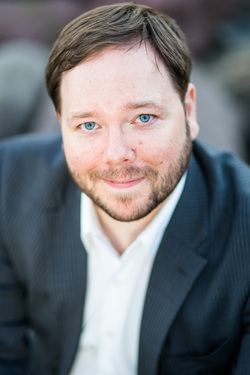 Tenor Christopher Hodson holds a Master of Music in Voice Performance and Pedagogy from Westminster Choir College and a Bachelor of Arts in Vocal Music from Western Michigan University. His operatic roles include Sam in Floyd’s Susannah, Pelléas in Debussy’s Pelléas et Mélisande, Chevalier de la Force in Poulenc’s Dialogues des Carmelites, Azael in Debussy’s L’enfant Prodigue, the title role in Bizet’s Le Docteur Miracle, Frederick in Gilbert and Sullivan’s Pirates of Penzance, Fenton in Verdi’s Falstaff, and Bill in Jonathan Dove’s Flight. In addition to his opera experience Christopher has also appeared as a soloist in Bach’s St. Matthew Passion with the American Classical Orchestra under the direction Tom Crawford, Mozart’s Requiem, Arvo Pärt’s Passio with the Michigan Bach Collegium, Handel’s Messiah, and Howells’ Requiem.